Piech (left) with his cousin Wolfgang Porsche. 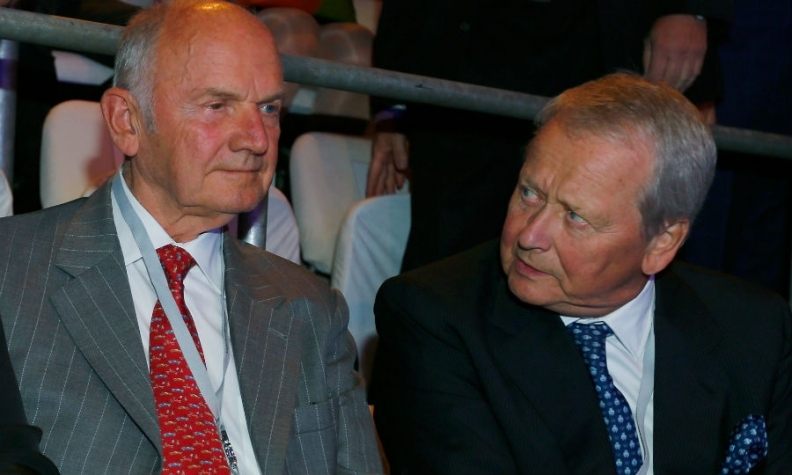 FRANKFURT -- Former Volkswagen Chairman Ferdinand Piech is set to lose his board seat at Porsche SE, in which the Porsche and Piech families have pooled their holding in VW, a German paper reported. Porsche SE's shareholders will vote on the future composition of the holding company's supervisory board at the annual meeting on May 30. A final list of candidates has to be decided on by mid-April. While Wolfgang Porsche and Ferdinand Piech's brother Hans Michel Piech are on the list of candidates, Ferdinand Piech is not, Bild am Sonntag reported, citing a person close to the matter. A spokesman for Porsche SE, which holds 52 percent of Volkswagen's voting rights, said that the future composition of the board has not yet been decided. Ferdinand Piech was not immediately available. He resigned as Volkswagen chairman after a showdown with former Volkswagen CEO Martin Winterkorn in April 2015. Last month, Volkswagen signaled it could take legal action against Piech after a media report said he had informed top directors about potential cheating of diesel emission tests six months before the scandal became public.